i have a tendency in all areas of life to switch on and off like a light, no happy mediums here. i pick up something new and eat, sleep, breathe it for a few months, then just as suddenly i'll switch off (usually because something newer and shinier has caught my attention). this flitting from one thing to another leaves huge gaps in the development of my knowledge and skills, but because i want to get into everything up to my neck as soon as possible, the people i look to for guidance and inspiration are generally those people who've stuck at it for a long time and developed in a much more rounded way. (coming to the point, promise) so this leaves me with that ever-familiar feeling that i'm racing to catch up. the world is turning without me and all those incredible projects in my head aren't getting made. and i get frustrated with all the things that are standing between me and my making time, and that's when it stops being fun. i just finished a quilt and my first thought was "okay what next", in the hope of clearing something off my mental memo board and making some space, without even stepping back and looking at the project i'd just finished. i forget it's possible to make space between and within projects, that it isn't a race. 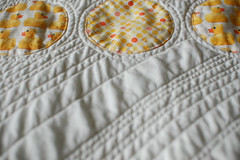 that, even though i have a shiny new work room to play with, free time can still be spent away from the sewing machine. that a rounded family life leads to a rounded creative life. and while being online can be motivating and inspiring, tbh the last damn thing i need right now is any more inspiration, at least until i can check off my half dozen current or imminently pending projects. and reading blogs gives me a serious case of keeping-up-with-the-joneses-itis too, so i'm pledging here to trim my bloglines and spend less random web time too. i doubt any difference will show here tbh, my sporadic drive-by FO posting will continue, hopefully at a sustainable pace.